The BMW E90 combines the use of forced induction and a silky smooth inline-six engine to produce very impressive power output, and an extraordinary response to additional modifications. Simple bolt-on modifications and tuning can net an additional 80 hp to 100 hp, which is an unreal bang for your buck. The E90 is a fantastic vehicle with all the creature comforts needed, while also generating quite a flurry of power when the skinny pedal is pressed to the floor. That being said, this vehicle is not completely faultless. It is plagued with typical BMW cooling issues, so water pump failures are quite common, and keeping coolant and oil temperatures under control can be an absolute nightmare. For those who do not have an oil cooler from the factory, even aggressive street driving can be an issue. By eliminating these pitfalls, one can have a very competitive track car that will also pick the kids up from school, or impress that Friday night date. This article is focused on our radiator design as a first step towards improving the cooling system. Not to worry though, as we have an oil cooler setup in the works that will actually let you take full advantage of the capabilities of this car. Many have tried to develop a radiator for this vehicle, only to fall short with the overall design or not complete the task at all. This particular radiator design is rather intricate and the stock unit occupies a very small footprint, making it quite a challenge to improve any of the cooling aspects. Our team is well versed in working with projects requiring an extreme attention to detail and utilizing precision components. We also have a ton of experience dealing with CNC-machined components, many of which are needed for this particular radiator. Both the inlet and outlet feature unique quick-disconnects that need to be properly replicated for a leak-free seal with the OEM hoses. Another challenge will be to increase capacity/size while maintaining proper fitment. Increasing core size is not a guarantee for improved performance. We will be taking a closer look at core designs to be sure we would have a product that can provide the best possible heat transfer. More on this later! For now, let’s set up our general goals for this project to see what needs to be accomplished. So that is the project in a nutshell, with pretty standard goals for one of our performance radiators. The big difference is complexity. I will go into detail about the reasoning behind these goals. For those with short attention spans (I’m with you! ), or who are sick of reading, feel free to scroll down for images of the stock radiator! We realize that cutting your vehicle (especially metal parts) is a tough sacrifice to make for an aftermarket component. As consumers ourselves, we would expect any product to fit without totally destroying other components. This concept is especially true with newer models, as well as premium vehicles, including your BMW! The bulky stock fan setup provides reasonably high CFM and is needed to cool the vehicle. We would need to make our radiator fully compatible with this unit. After years of clutch fan use, BMW has finally fully converted to the use of electric units! This is quite exciting and a relief after having to deal with faulty units blowing apart hoses, putting gashes in radiators, and even blasting into the hood and causing body damage. The clutch fan is a great concept, inexpensive and generally fairly simple to replace. Our most recent testing of an E46 M3 showed that removing the clutch fan generates some easy power (5 hp on the top end), thanks to the reduction in rotating mass. The E90 models utilize a single electric fan housed in a plastic shroud, so we will need to provide mounting points. We will also need to make sure that enlarging our radiator does not cause issues with the shroud being pushed closer to the engine. BMW uses some pretty slick quick-disconnect radiator hoses for a majority of their post 1990s models. These have several benefits. They eliminate the use of hose clamps, proving a more secure and dependable connection that doesn’t rely on how much torque is placed on the clamp. They also provide a slightly quicker removal process. Although some will see this as a way for manufacturers to charge more for a radiator hose, I think it’s a nice upgrade to the style of radiator hoses that have been used for nearly a hundred years! Change is good! Now, this might create a better seal but it also makes the jobs of our engineers a bit more difficult. Instead of measuring a tube diameter and developing a straight inlet/outlet, they now have to fully replicate the OEM design to allow for a perfect connection. This is a cumbersome process, but produces a really clean looking component. Our next goal is to increase the capacity/size of the radiator. You will see very shortly how tiny the stock radiator is, so you would think we have some room to grow. Unfortunately the engine bay is extremely cramped in this application, making this a difficult task. That being said, I am sure we can sneak out a few millimeters of thickness in one direction or another. The fifth goal is the most important of the bunch. The primary goal of any heat exchanger is to, well, …. exchange heat. We want to reduce coolant temperatures as much as possible. With the tight packaging of the engine bay and the addition of hot turbocharger(s), things can get rather warm under the bonnet. Reports of high coolant and oil temperatures across the globe have really tainted the general perspective of this vehicle, and we are hoping to uncover a solution. Although this particular project will not deal with oil temperatures directly, reducing coolant temperatures will have an impact on oil as well. We have several ways of managing coolant temperatures, which will be discussed later on. 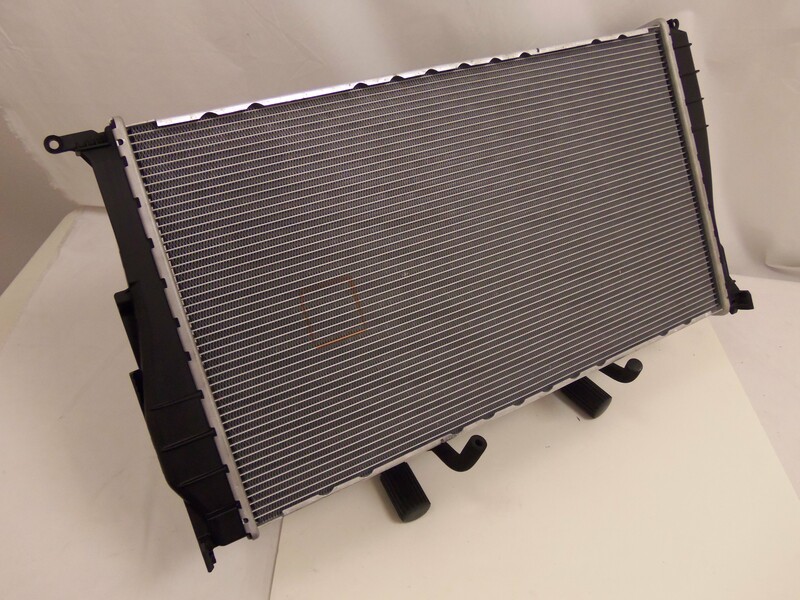 Lastly, this radiator will be made specifically for manual transmission vehicles. Automatic models utilize a port in the bottom of the radiator for transmission cooling. This limits the stock cooling system even farther. Yes, we realize you automatic guys are in need of additional cooling as well. If you are in this position, please send us an email with a recommendation. If we can gather some interest we can certainly explore adding an automatic version of this radiator to our product line. Stage 1 of this project will be applicable for manual models only. Wow Mishimoto! You are really stepping it up in the BMW market! Why yes, yes we are. We have set aside quite a bit of time in the past year as well as 2014 to focus on BMW-specific components. 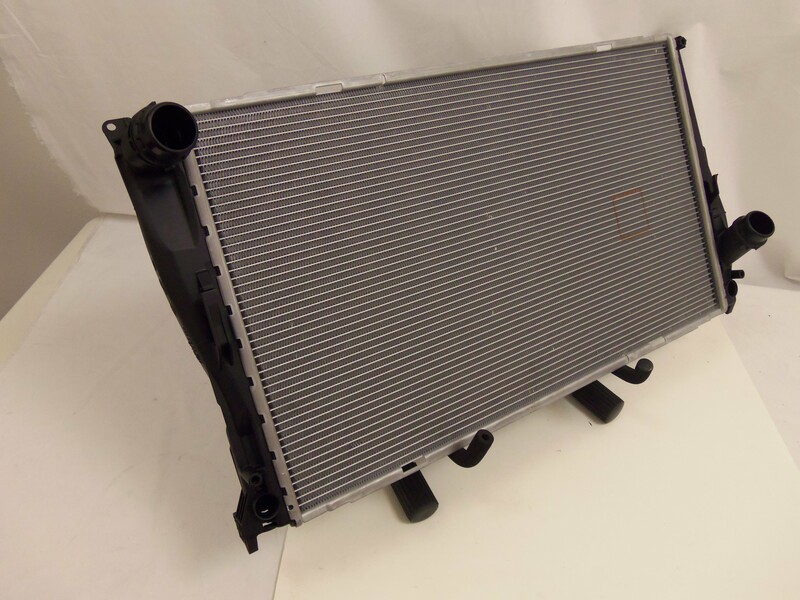 We recently released our E90 intercooler and are working hard on an E36 race radiator, E46 M3 radiator, E46 M3 oil cooler, E46 M3 fan shroud with electric conversion, and a few other very nice products. Our company caters to all manufacturers, so it is quite a challenge to find time to cover all enthusiast vehicles. We found that the BMW world is a place we need to be. BMW enthusiasts are very passionate and crave innovative components and hard, legitimate data. We are working hard to meet these needs. BMW also has an impeccable history of producing enthusiast vehicles that everyone can enjoy and fall in love with. From the 2002 model, to the M3, all the way to the brand new I8, BMW has a way of keeping customers interested and excited for what is coming next. Enough writing! Let’s see a few images to change things up. Evaluating the factory component is the first step to new product development. If the factory component is flawless and cannot be improved, then why proceed? This is practically never the case, as the OEM is usually under serious budget constraints that do not allow for full product creativity or expensive design. We are not building vehicles here, just improving them, so we have quite a bit more freedom in budget, design, and time. So, it’s just a radiator right? Wrong! This is one of the most impressive factory radiators we have seen to date. It may be hard to judge from these images, but the overall size of this unit is very small, considering that it cools a 3.0L turbocharged six-cylinder engine. The core size measures 23.75” X 13.5” X 1.3”, small for a vehicle like this. In comparison, I have listed a few other vehicles (with similar power output) along with their respective radiator core sizes and volumes. This chart provides a good idea of the ratio of power to cooling volume, as far as the radiator is concerned. Obviously this is not the only factor contributing to engine cooling, but the E90 is clearly a smaller unit than similarly powerful vehicles from other manufacturers. BMW achieves this by manufacturing its radiator with an extremely dense fin pitch. Take a look at the next few images! 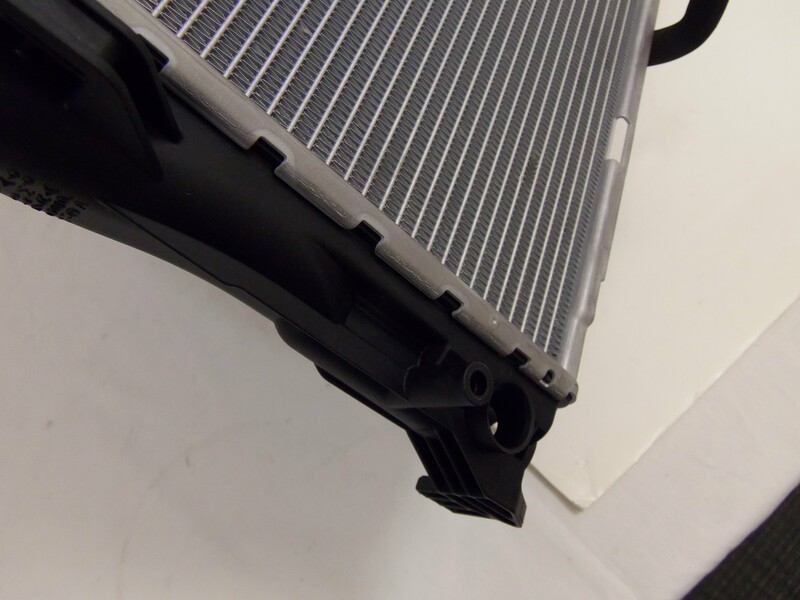 By using such a dense core, BMW is able to cram a good deal of cooling into a small area. The tighter fin pitch allows for more heat transfer points, which provide improved performance per square inch compared to a core with taller fins. With a shorter fin, additional coolant tubes can be added for improved cooling. What does this mean for us? It means we need to meet or exceed the core density of this factory unit as well as try to improve core thickness. Also, this radiator must be properly tested against the factory unit. It must provide improved cooling at idle, at low speeds, and at highway speeds. Now, let’s take a look at some of the additional features of the factory radiator. This image shows the pesky quick-disconnect inlet/outlet. Some people love them, while others curse them. I am sure that most BMW enthusiasts have worked with these radiators at some point or another. Since our radiator will have full aluminum construction, the inlet/outlet will need to be CNC-machined from aluminum and then welded to our end tank. 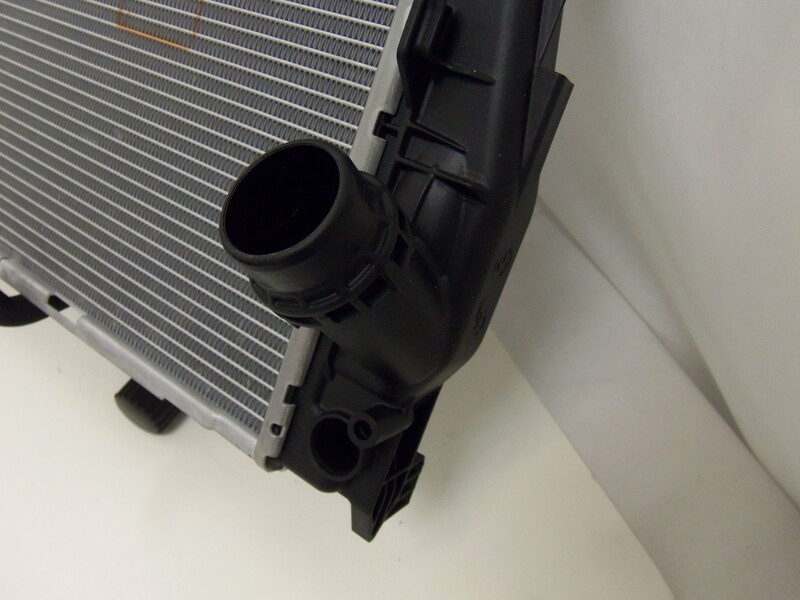 This will allow our radiator to have even better concentricity and improved overall dimensional tolerances compared to the plastic-injected stock inlets. Here you can see the fittings for the transmission cooler portion of the OEM radiator. 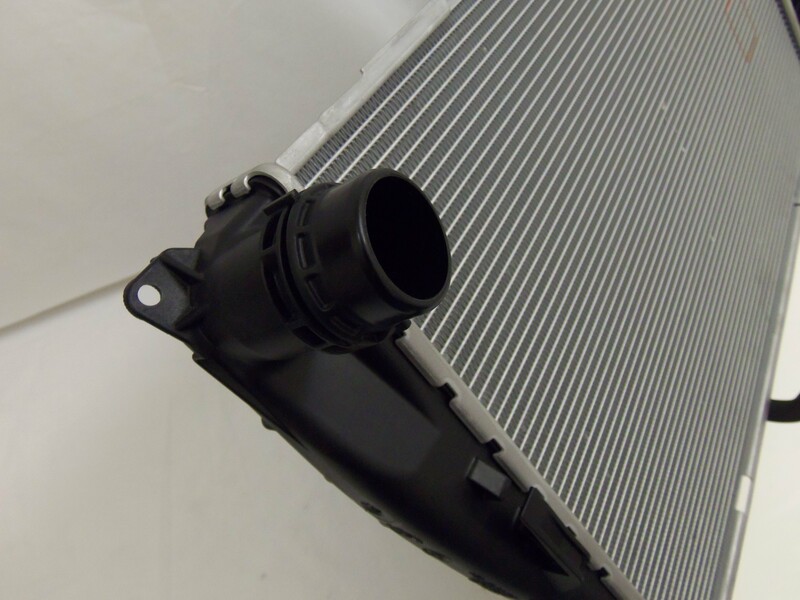 This system occupies quite a large amount of space in the lower portion of the radiator. Now, take a look at the core thickness. 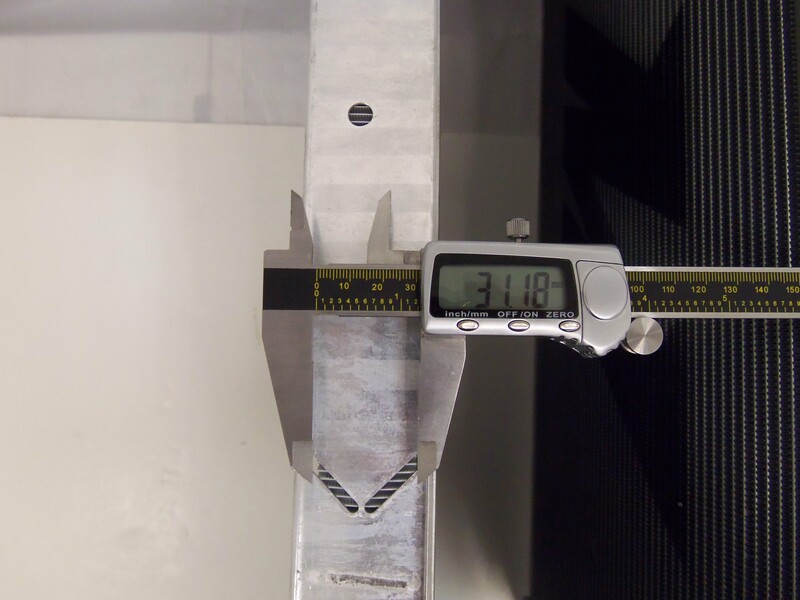 The stock core is 32–33 mm thick. The upper and lower plates overhang the actual core by a significant amount, making it appear thicker than it actually is. This measurement will be key in comparisons to the prototypes we develop. Our goal is to improve thickness by at least 20%. We‘ll see if this is possible! This concludes the first portion of development for this radiator. You may be thinking to yourself, “Mishimoto! All you did was talk about the stock radiator!” True, but the stock radiator is what we use as a base for our product design, and we also intend to compete against it in performance. 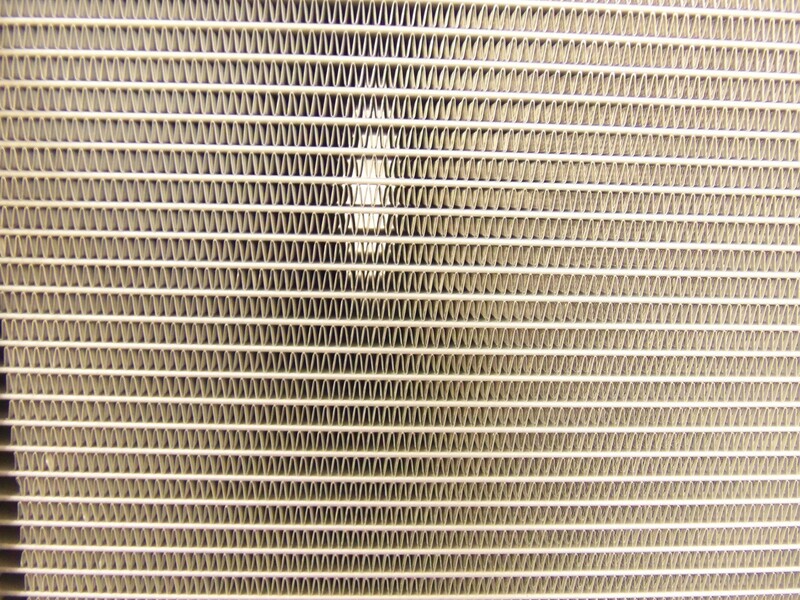 We pull a ton of information from the stock radiator, and many E90 owners have yet to remove their radiator and take a good look at it. Well, now you have seen all the features, pitfalls, and specs. Next time we will show you a few prototype designs and compare them with the stock unit. Actually, one of our prototypes may have sneaked into that last image!!! so you guys have a pretty spotty history on manufacturing through your supplier.. for an expensive car like a new BMW, what are you doing to ensure that your product is up to par? Thanks for the inquiry and I apologize for the delayed response. Our company is constantly improving all aspects of product design, testing and manufacturing. One thing that effects our overall end products is actually our facility. Our facility features a plethora of equipment that allows our engineering team to design our products as well as test them. We have an in-house Dynojet as well as full data collection capabilities using our PLX devices to monitor temperatures, pressures, etc. This ensures that our products go into production with positive test results and shows that our products provide actual real-world benefits to your vehicle. Once in the manufacturing process, we select appropriate materials to ensure a high quality product and our quality control team provides a huge benefit to reducing any defects that come with production. Using these processes, we have witnessed our defect and warranty return rate plummet. For those who do have issues, we offer a lifetime warranty to ensure that all of our customers are completely pleased with our products. This company is constantly making huge jumps in product improvement and we stand behind every item that hits shelves from Mishimoto. For more information regarding our facility and equipment, check out the “Learn About Mishimoto” tab on the home page! In reference to the E90 radiator you are posting about, as you can see we are putting this radiator through several processes including some real-world testing very soon. 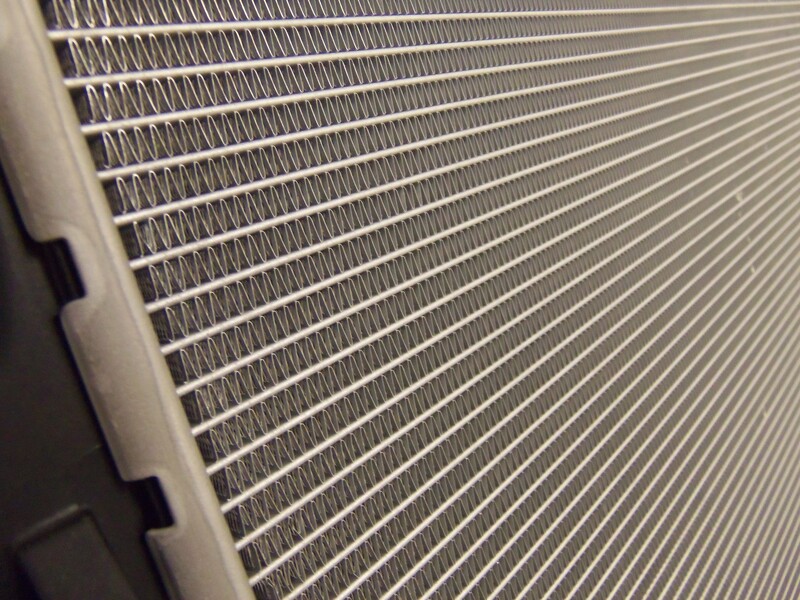 Our goal is to provide a more efficient heat exchanger that will maintain lower temperatures in a track environment. We should have some really nice data by the end of the month regarding this! Let me know if you have additional questions, I would be happy to help.